At Safe Pro Pest Control in Frisco, TX, we think about cockroaches every day – along with a lot of other pests, of course. We think about how to prevent cockroach infestations and how to take care of the ones that do happen. We think about roach species, habitats, lifespans and all of the other important things we, as professionals, need to know to control them. For most people, knowledge of cockroach minutiae is limited to knowing that the bigger ones make a louder crunch when they’re squished. Cockroaches are generally flat and oval-shaped with six legs and a pair of antennae. German cockroaches range in size from to in length, are light brown in color and have two, dark stripes running down their backs. Like most cockroaches, German cockroaches prefer to live in warm, humid environments out of sight of prying eyes. They like to be close to water and food sources, which is why you’re likely to find them scurrying around under sinks and in cabinets where you store dry goods. German cockroaches are attracted to homes that give them an ample supply of both food and water; but they tend to have a little help finding their way into our homes – in grocery bags, cardboard boxes and even in used appliances. German cockroaches will eat pretty much anything, including toothpaste, soap and glue. At Safe Pro Pest Control in Frisco, TX, we know how much of a nuisance cockroaches are; but, more importantly, we also know how dangerous they can be. 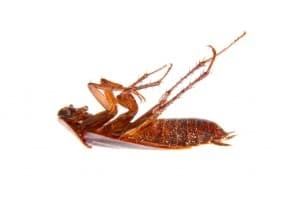 German cockroaches carry germs and bacteria on their legs that they get from crawling through one of their favorite food sources, decaying matter. They then carry these germs into our homes and across our kitchen counters, food and other places that we come into contact with. In fact, cockroaches can spread 33 different types of bacteria, 6 kinds of parasitic worms and at least 7 other pathogens that can cause diseases. Additionally, the saliva, droppings and dead skin of German cockroaches can trigger allergic reactions – from mild to life-threatening – in humans. Your main weapon when it comes to preventing or reducing the severity of a German cockroach infestation is cleanliness. If you keep your home from having a lot of readily-available food sources for cockroaches, you’ll help to keep the problem in check. Vacuum often and keep crumbs off of countertops and floors. Make sure you seal up dry goods in airtight containers or bags. Empty your trash promptly and make sure to clean up around pet feeding bowls. You should also make sure that any leaking pipes are repaired to reduce the amount of moisture that roaches have access to. To find out more about controlling German cockroaches in your home, call us at Safe Pro Pest Control in Frisco, TX at (972) 435-0700. You can also visit us online at www.safepropest.com.